eNLokam: Indira Gandhi among the 25 Most Powerful Women of the Past Century! Indira Gandhi among the 25 Most Powerful Women of the Past Century! Time magazine, the world famous journal placed India’s former prime minister Smt. 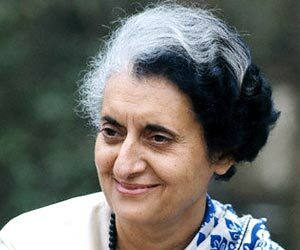 Indira Gandhi among the most powerful women of the world. Indira Gandhi and Albanian nun Mother Teresa, who made India her home, are among Time magazine's "25 Most Powerful Women of the Past Century." The US news magazine's survey of "the women who have most influenced our world" is topped by Jane Addams, an outspoken advocate for women's causes. She was the first American woman to win the Nobel Peace Prize. The list includes US Secretary of State Hillary Clinton in the sixth place. Indira Gandhi ranked ninth, figured on TIME cover when she was elected Prime Minister in 1966 with a line reading, "Troubled India in a Woman's Hands." "Those steady hands went on to steer India, not without controversy, for much of the next two decades through recession, famine, the detonation of the nation's first atomic bomb, a corruption scandal and a civil war in neighbouring Pakistan that, under her guidance, led to the creation of a new state, Bangladesh," the magazine said. "By the time she was assassinated, in 1984, Gandhi was the world's longest-serving female prime minister, a distinction she holds to this day." Mother Teresa is ranked 22nd in the list. Time said: "Her iconic white garb with its blue stripe trim is now equated with her ideals of service and charity among 'the poorest of the poor. Sometimes criticised for lacking adequate medical training, not addressing poverty on a grander scale, actively opposing birth control and abortion and even cosying up to dictators, the winner of the Nobel Peace Prize nonetheless inspired countless volunteers to serve, and will wear her white habit all the way to Catholic sainthood,". India has more things to cheer.